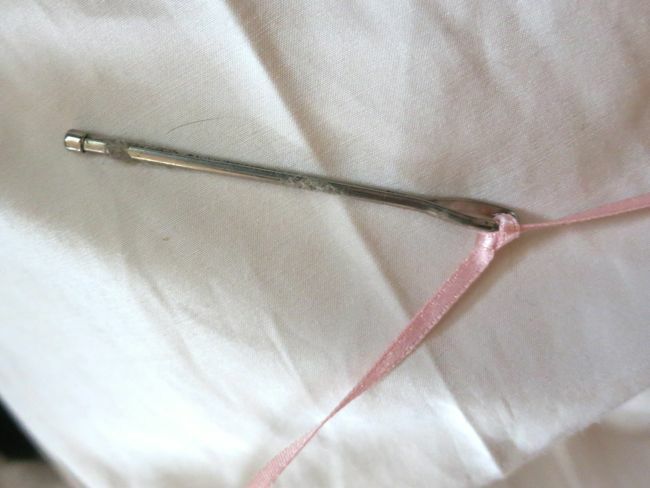 A bodkin, also known as a lacing or threading needle (and occasionally a ballpoint needle, but then it gets confused with the needles we sew knits with), is a large needle with a very large eye, and a very blunt end, used for lacing corsets, threading ribbon through lace beading, cord through casings, or any other time when you need to ‘carry’ a yarn without the chance of poking holes or sewing through something. Bodkin is also occasionally spelled bodekine, bodikin, botkin, bodkine, and boidken. To create a bit of confusion, the word bodkin also refers to almost the opposite tool: a sharp, pointed tool for poking holes in leather or fabric (like an awl). And bodkin is also a decorative hairpin, particularly one that is shaped like a stiletto dagger, and a stiletto dagger is itself a bodkin (keeping up?). Though there are pointed bodkin awls and pointed bodkin daggers, on a pair of scissors with a blunt, rounded tip to one blade, and a sharp, pointed tip to the other, the blunt, rounded point is the bodkin end (because a bodkin is a blunt needle), and the sharp, pointed end is a vigo point. Tools that are essentially bodkins, in their use (as a carrier needle, or awl) and physical form (a pointed implement, to thick to be used on its own, but with a hole to carry a cord), date back to Neolithic times. The basic qualities of the shape, and the way that the tool could be used for multiple purposes that might overlap, help to explain why, thousands of years later, we use one word for a variety of tools. Historians theorise (based, I believe, on very strong archeological evidence, and seeing these same techniques used in modern-ish stone age cultures) that a Neolithic sewer would always have made holes in hides using an stronger stone awl, and would then use a bone bodkin to pull a lacing cord through to stitch the hides together. Awls needed to be made out of stronger materials, and it was difficult to drill holes in the stronger materials, so they couldn’t be needles on their own. And the softer materials that could be drilled as needles/bodkins weren’t strong enough to poke their own holes. Once fabric was invented, weaker needles could be used to poke and sew in the same motion, and advances in technology made needles stronger, and thus able to sew through thicker materials (strong steel needles were introduced into Europe from China in the 1sth century AD, but aren’t regularly found throughout most of Europe until the 16th century). Bodkins in the modern sense, as a type of needle with a specifically blunt end, rather than a pointed one, probably appeared in Roman times. The name bodekin or badekin is first used in English in the 14th century, and comes from the Middle English boydekin, for a dagger. It’s likely that a bodkin-stilleto (dagger) could look so much like a bodkin-awl (or vice versa), that they would be called by the same name, especially as they might occasionally be used for the same purpose. Following on this, both the awl that poked the original hole, and the tool-with-hole that carried the thread through the hole later would take the same name. Once bodkin-needles were used as decorative hairpieces, non-functional-as-bodkins hairpins with a similar look would also get described as bodkins, and we end up with four different items called by the same term. Bodkins as threading needles were almost certainly in use in Europe in the Middle Ages: a bone one showing evidence of extensive use was found in a Medieval excavation in Pevensey in Sussex. Certainly the numerous laced garments worn in the Medieval period would have made them very useful items. 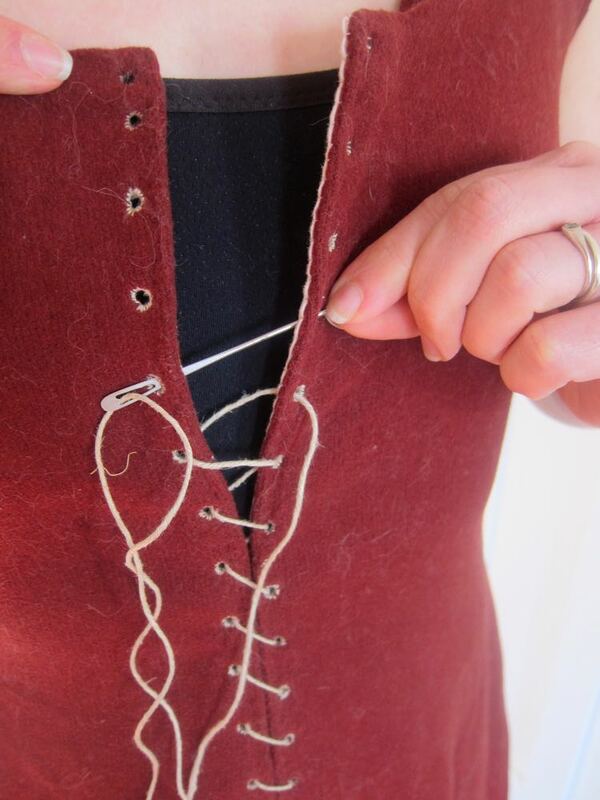 Though they were probably in regular use throughout the 14th, 15th, and 16th centuries, there are few mentions and extent examples of bodkins-as-threading-needles before the 17th century, when they become quite common. Both men and women wore garments that fastened with lacing across most of this period, so a bodkin would be an absolutely essential aid to dressing. She shall have a rough Demicastor with sugarloaf crown, coifs and cross-cloathes numberless, a silver Bodkin to rectify her stairing hairs, new Neats-leather shooes that creak, and murray worsted stockings. 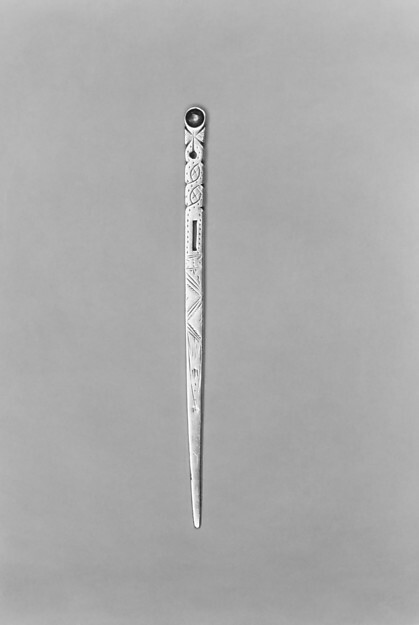 Dryden is using bodkin as a hairpin, but there is some evidence that the term bodkin as a decorative hairpin came from a 17th century practice of wealthy women tucking their elaborate silver bodkins (of the lacing variety) into their hair and hats to show them off, in the same way that fancy chatelains were worn as fashion and status symbols in other periods. This practice is best shown in 17th century Dutch genre paintings, and there are mentions of the wearing of bodkins in New England in the 17th century. 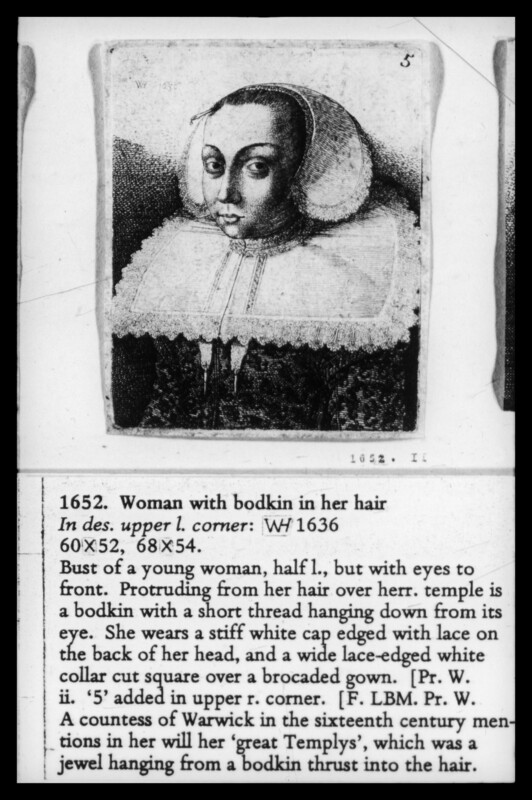 In 1663 a woman in Massachusetts was charged with ‘wearing a silk scarf and a silver bodkin when she was a widow,’ because the sumptuary laws in the area restricted ‘ostentatious dress’ for those on lower incomes. Given the cross-cultural interchange between the Netherlands, England, and the New World in the 17th century, it’s likely the fashion was at least seen if not adopted in other countries. 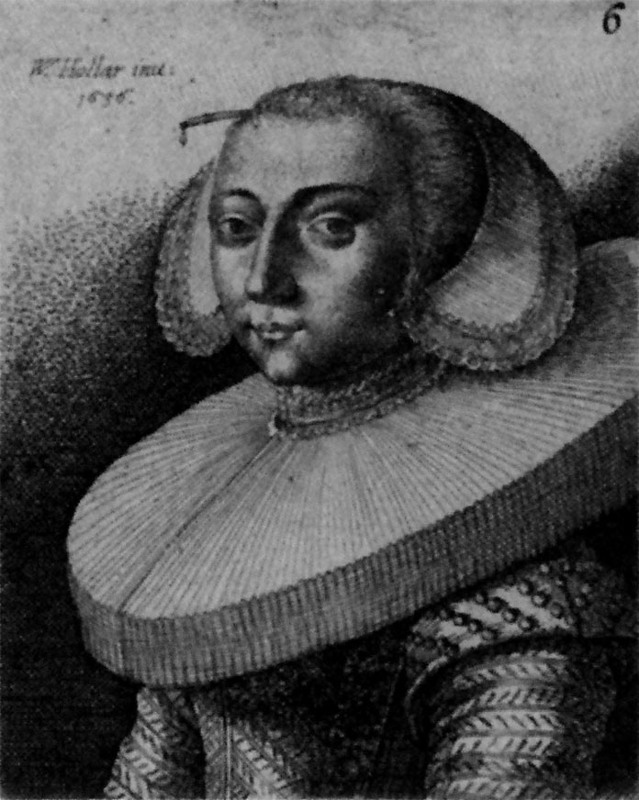 Wenceslaus Hollar did at least two versions of this image of a woman with a bodkin in her hair (the second version is above) and it is clear in both versions that the bodkin is a true working bodkin, rather than just a decorative hairpin. In some locations women could apparently show their marital status by whether they wore a bodkin on the left or right side. 17th century bodkins were often highly decorative and elaborate, and made of valuable materials such as silver, as a status symbol that could be flaunted when they were used or worn decoratively. Some 17th & 18th century bodkins had wider ends shaped like scoops, that could be used to clean ears of earwax. Apparently the excavated wax could then be used to wax sewing thread by sewers who did not have beeswax handy, or were too thrifty to use it (a story, which if it is true, could presumably potentially be verified by dna testing of 17th and 18th century garments). Both elaborate silver ‘status’ bodkins, and simple, utilitarian mixed-metal bodkins were frequently inscribed with the name or initials of their owner, either by a professional, or roughly by the owner themselves, indicating how important and personal an item they were. Because bodkins were such an important sewing and dressing aid, and because at times it could be almost impossible to dress without the use of one, bodkins were carried in special bodkin cases (by both men and women), or in decorative cases called étui which could contain bodkins, needles, and other mixed sewing equipment. Étui and bodkin cases are more common in the 18th & 19th century, once the 17th century fashion for wearing them on ones person as a decorative accessory had passed, but there are also 17th century examples. 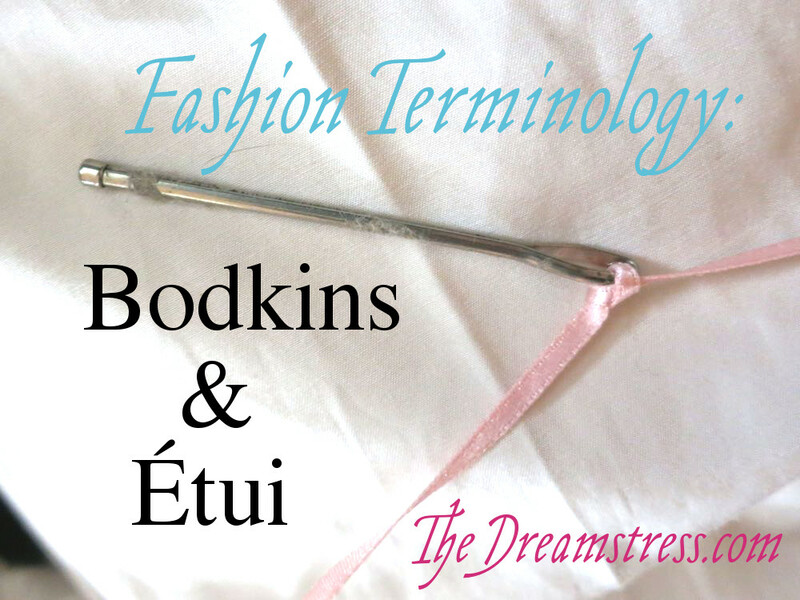 You can tell the difference between a bodkin case and a needle case by looking at the size: a bodkin case is larger than a needle case, but étui was used as a more general term, so the same item might be called a bodkin case by one person, and an étui by another. Cases which came with specific items, like this charming example which, like a chatelaine, could hang from a girdle, were definitely etui. Étuis holding bodkins and needles could be part of chatelains themselves. Bodkins continued to be an important part of a woman’s sewing kit in the 19th century, though they were used less for dressing as laced garments became less common, and permanent lacing aiglets on the ends of laces for garments became cheaper to mass produce, and thus more common, making bodkins for dressing obsolete. 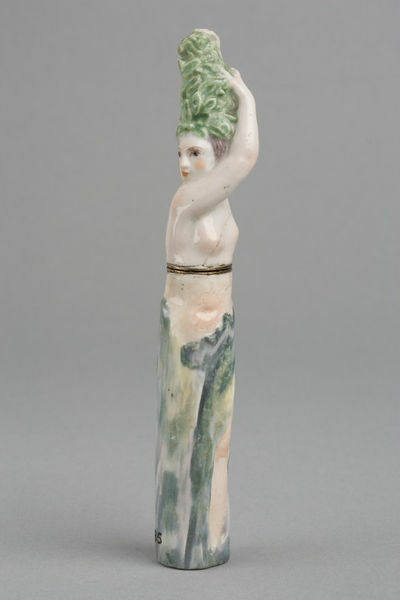 Though Ellen’s mother is depicted as a very careful, conscientious woman, who would presumable take very good care of all her tools, her bodkin shows the signs of wear and tear, demonstrating how often it was used, and how important it was as a tool, even if less garments were worn laced. 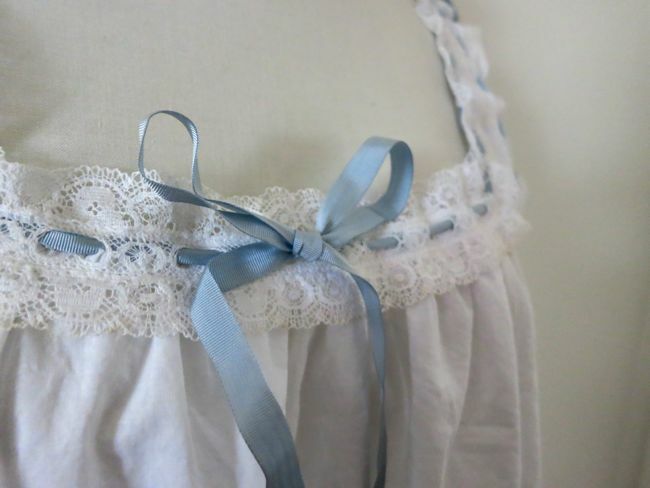 Ellen’s mother would have used her bodkin to thread tape through garments with drawstrings, and to thread ribbon through beading lace, as well as occasionally using it to do up a laced bodice. It was only with the rise of elastic for simple waistbands and other gathering, and the decline in popularity of garments with beaded decoration from the ’20s onward, that bodkins became less important. The rise of pre-made garments, and decline in home sewing also did away with the bodkins, as occasional sewers found that did not need a specialist tool for the few times they needed to thread a channel, as they could use safety pins for their threading rather than a bodkin. 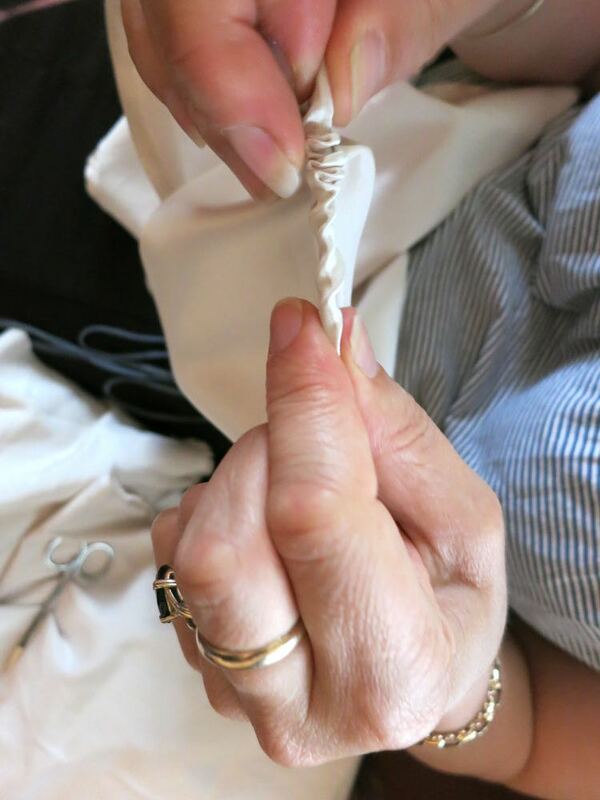 Although they are no longer a wardrobe necessity, you can still buy bodkins at good craft shops, and they are a really helpful accessory to have as a historical seamstress – just as they were for our period predecessors. But I’m also cheap — the bodkins I use are plastic needles from little kids Baby’s First Sewing Kit which are usually actually needlepoint kits. I have two, and they’ve held up quite well for years! Looks way more fun to use than the saftey-pin-through-the-channel method I have employed in the past. oddsbodkin.netI love your terminology blogs. Although I am not an accomplished writer, I love words, the sound of them, their meanings and history. Bodkin is such a solid but almost romantic sounding word. The first time I remember wondering about the meaning was when I attended a storytelling workshop run by a gentleman known as Odds Bodkin. As to my use of bodkins, I now use my flute cleaning rod. It has a blunt point and a very large eye. It is fabulous for running elastic through a waist channel. I have included the url for Odds, just in case anyone is interested. Please continue to enlighten us on the vocabulary of sewing! And I used a bodkin just the other day, for sewing up slippers knitted from thick wool – even better than a wool needle! That was wonderful! But the cause of wailing! I’ve got two of them, and I have never known what they were! I have spent my life threading elastic, ribbon etc with safety pins and reversed darning needles!!! With much muttering, because neither is perfect. But I can see how the bodkins would be. Wow! This post was really amazing and enlightening. I love the linguistic detail you included and I’ve never been particularly exposed to sewing /needlecraft history before. Very cool, thanks! I bought a bunch of boxes at an estate sale. he previous owner had been a serious seamstress and I managed some great finds. In one box was 3 bodkins: a large 3 1/4″ , 2 holes, flat, plain but stamped Sterling- very heavy. The second, also flat, 2 holes has a ribbon slot on one end , rounded with a hole at the other end. Took me a while to research what they are. third is a mistery. it is very thin, about 3/32″ acrosshas a tiny hole, then what looks like a 6 petal flower stamed, then the larger hole and more stamping under it. It is 2 1/2 ” long. Loks like a simplistic crown and under is the letter M. The tip is sharp. I have looked and looked for an answer. any ideas? Hi I recently found a silver bodkin in the UK. can you shed any light on it please possible age etc – it has eyes at both ends! How do i send you images? They will be available on facebook.com/oswestryunearthed. if you can help? Sorry, I’m familiar with general bodkin history, but am no good at identifying specific bodkins by age. Best of luck in finding further information on it. Previous PostWhat shall I wear to a Bastille Day Ball? Next PostA Bastille Day Masquerade Ball!